How about a veggie recipe today? This is a super simple recipe; almost not even a recipe at all, but a good method to know. I love roasted veggies. They are my all-time favorite. But sometimes roasting veggies doesn't work so well if the main dish is hogging the oven. I haven't had great luck with putting two different things in the oven together, especially if they cook at different temperatures. So if my main dish uses the oven, I will try to choose a veggie that I can make on the stove top. One day I was making dinner and realized I had some cauliflower that needed to be used up. Problem was, I always roast cauliflower, but my main dish was baking away in the oven at a lower temperature. A light bulb went off, and I decided to try roasting the cauliflower in the skillet. I thought it would probably take forever for the cauliflower to cook through in the skillet, so I parcooked it in the microwave first. Then I sautéed it in some butter in the skillet until it got golden brown and delicious. 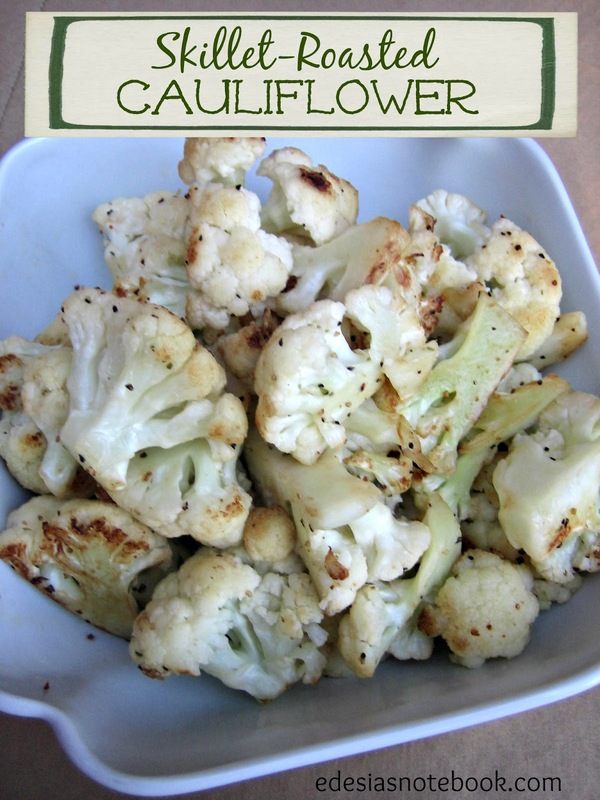 Cook cauliflower in large microcooker in salted water for 6 mins. Drain well. Melt butter in large skillet. When it starts getting foamy, add cauliflower. Cook on medium-high heat until browned. Season to taste. I use the Pampered Chef Micro-Cooker for this, but if you don't have one, you can use a microwave-safe bowl covered with plastic wrap. Like I said, this is super simple. But it has really come in handy for me several times. It has that great roasted taste with all the convenience of stove top cooking. This method would also work with broccoli. Maybe even Brussels sprouts. I'll have to give that a try soon. Here's what my three-year-old daughter, Eva, said when she tried it: "It is yummy in my tummy, it is yummy in my tummy!” So nice, she said it twice!